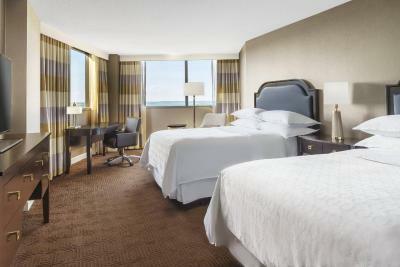 Lock in a great price for Sheraton Baltimore North – rated 8.4 by recent guests! Everything about the facility and staff are nice. It's the awful noise in the middle of the night that was bad. See comment below. The beds, pillows and bedding were extremely comfortable, the room (with the exception of the bathroom) was clean and spacious. Beds! We always say we can’t wait to get back I to their beds and pillows! I liked how soft and comfy the bed was. pretty much sums up this $100 room. The location was great for my needs. Close to the mall, restaurants and the university. The bed was comfortable. The desk staff were great. The location. The staff was very helpful. Loved being so close to the mall. Housekeeping was great. They were so friendly and efficient. It's the best place to stay in Towson. And the walk to Goucher College is quick and easy. 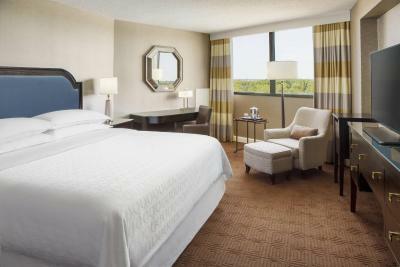 Sheraton Baltimore North This rating is a reflection of how the property compares to the industry standard when it comes to price, facilities and services available. It's based on a self-evaluation by the property. Use this rating to help choose your stay! 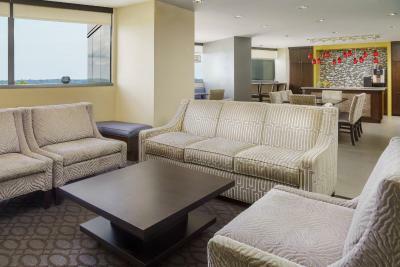 This Towson, Maryland hotel is located within a 20-minute drive to Baltimore’s Inner Harbor. This hotel features an indoor pool and public computers in the lobby. 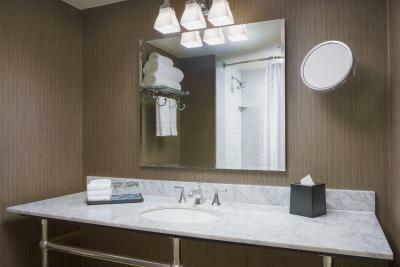 Rooms at the Sheraton Baltimore North have free Wi-Fi and cable TV. 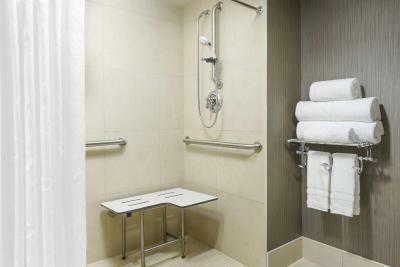 Rooms are equipped with a coffee maker and refrigerator. 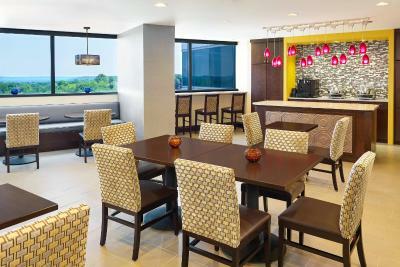 Guests at the Baltimore North Sheraton can dine at the Rain 903 Restaurant, which serves American cuisine. Room service is also available from the restaurant. The Sheraton Baltimore North is next door to the Towson Town Center mall. Oriole Park at Camden Yards and Ravens Stadium are within a 25-minute drive from the hotel. This property also has one of the top-rated locations in Towson! Guests are happier about it compared to other properties in the area. This property is also rated for the best value in Towson! Guests are getting more for their money when compared to other properties in this city. 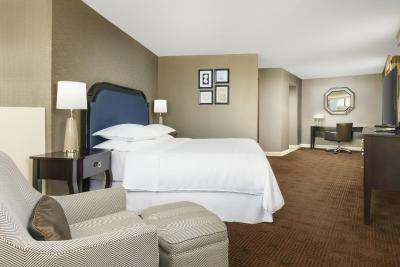 When would you like to stay at Sheraton Baltimore North? Public parking is available on site (reservation is not possible) and costs USD 10 per day. 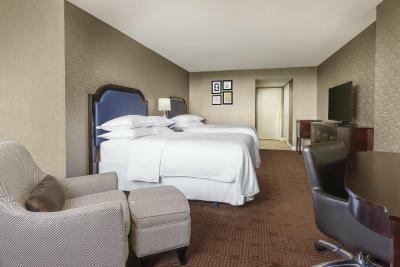 House Rules Sheraton Baltimore North takes special requests – add in the next step! 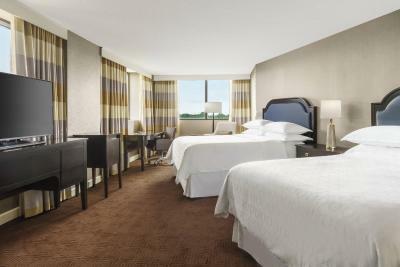 Sheraton Baltimore North accepts these cards and reserves the right to temporarily hold an amount prior to arrival. I was impressed with the cheking in procedure . Service was interminably slow...food was creative but lacked flavor. At 1 AM the very rude people in the mall next to the hotel began cleaning their parking garage. The loud noise woke up my wife and me and kept us awake for over an hour. I was told by the night staff that this happens regularly, and that the hotel has complained before but the mall managment blows them off. I am likely to stay at another hotel in the future if that be the case. I think that the hotel needs to either call the police, get a lawyer or otherwise take strong and determined action to stop that behavior from those very rude people managing the mall next door. I am a regular weekend customer of this hotel (and have been for years) and have never been disappointed before. The bathroom was not very clean (hair in the shower and tub) and a little run down...rust, mildew, stained countertops, etc. The noise level was ridiculous. A bit dated but truly didn’t mind since it was clean. Great location. Nice size room. On our arrival, the hallway was lined with cots for a few hours. There was a hole in the fitted sheet in one of the beds. Even the heat all the way up, the room was cold. We had to complain about the room next door on our second night. They were very loud all night and even the next morning.